If this was Tool Time with Tim Allen, I would have had to start this post with “What do we want? More power! And so, I rewired it!…” only to be followed by “WARF…WARF… WARF…” But I am not the great Tim Allen, much less did I need to rewire anything. I do love the idea of more power, so in the next tale of “prowess” and smoke-free adventure, I shall detail how I managed to squeeze my stepper driver to operate at an astounding 3A even when they are rated at 2.5A. The driver in question would be the DRV8818, an 8 microstep bipolar stepper motor power stage. I have explained many times why integrated microstepping drivers are fascinatingly great, so no need to repeat it. All I will say is that with a STEP/DIR interface, operating a stepper simply can’t be any simpler. These drivers make CNC electronics Kindergarten projects, so if you are still sucking your thumb and wearing diapers, I have to say I am impressed you are reading this blog. But let’s move on! The DRV8818 is rated at 2.5A and has an Over Current Protection setting of 3.5A. This is important for a few reasons. First, what I can deduce for this valuable piece of information is that if I try to pass any thinkable current, the device will not mind as long as the current is smaller than 3.5A. Anything larger, and the device will disable itself as it fears its outputs are deadly shorted. Better to get disabled than to get smoked out. So why not rate the driver to 3.5A, instead of 2.5A, and get it over with? I could state the reason is head room, but the truth is a little bit more sinister. What truly kills us here is the temperature. Darn it! Always the temperature! And so instead of a super conductor, what we end up with is more like a resistor. In other words, the power switches which make up our H Bridges (like any other switch on this planet), are actually resistive . Switch resistance is a factor of how big the switch is: The bigger the switch, the smaller its resistance. Also, the harder it becomes to turn it ON and OFF, not to mention they become more expensive, but I am complicating things too much already. No need to bug down our minds with economical realities, let’s just focus on the electrical aspect. In order to determine how hot these devices will get, we need to use the I^2*R equation. We know R = 0.54 Ohms, but what is I? Let’s assume 2.5A as that is what the device is rated for. Since we have 2 H Bridges, the total power dissipation inside our DRV8818 while running at 2.5A sine wave peak is 3.37W. Now, if you add some switching losses, the total power dissipation should grow closer to 4W. Something I have not mentioned is that the DRV8818 comes enclosed in what is known as an HTSSOP package which as it turns out is rated at 4W total power dissipation. What this means is that if you solder this package to a very nice and sturdy PCB with lots of copper, vias and all those goodies, it will be able to effectively dissipate 4W without getting too hot (or at least not hot enough to trip its protection). Anything higher than 4W, and the package (along with the PCB) will not be able to release the heat into the outer world as we need it to. In other words, the heat will build up, the die will get too hot and eventually the device will shut down because of its internal thermal shutdown protection. 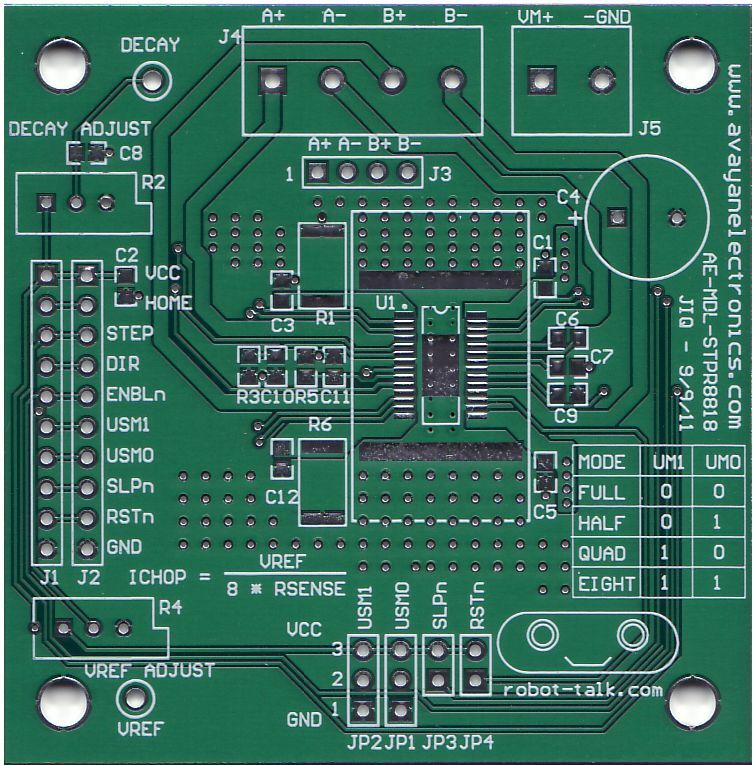 Figure 1 shows one of my stepper driver designs, which consists of a two layer board capable of housing a DRV8811 or DRV8818. Notice there is a heat slug which is meant to interface to the DRV88xx’s Power Pad and there is copper flowing away from this center with the goal of moving heat away from the package as quick as possible. Now I am “boasting” here on how I was able to take the DRV8818 to 3A. A quick look at our previous equation would tell us that at 3A sine wave peak, our total power dissipation due to resistive losses would be around (3*0.707)^2*0.54*2 = 4.859W. If the package invokes the angels of doom at 4W, how on Earth can I pretend to sell the tale that I was able to take it to 4.85W? Where am I tripping? Not much of a substance abuse trip here, although I will admit I have been lacking one vital piece of information and that is the concept of Thermal Impedance. When we say an HTSSOP package can successfully dissipate about 4W of power, this implies we have soldered the Power Pad device to a nice board and while following the manufacturers suggestions. If this is what you do, it is close to impossible (AKA ridiculously hard) to achieve 3A with the DRV8818. I mean, you may be able to submerge the device in liquid nitrogen and go to the 3A, but that is not what the manufacturer recommends. What is happening here is that as you solder your HTSSOP device into a good enough board, you get a thermal impedance of about 30 to 40 Degrees C/W. This thermal resistance is a measurement of how easy it is for the heat inside of the device to head out, but it also leads us to the concept of temperature rise. The way we get this temperature rise is by multiplying the Thermal Impedance (in C/W) by the actual power dissipation (in W). In our example, at 4W power dissipation and about 30 C/W thermal impedance we get a temperature rise of 4 W * 30 C/W = 120C. If your ambient temperature is 25C, then the device dissipating 4W on a 30 C/W board interface will be as hot as 145C. Since the TSD protection kicks in at about 150C, you can already see there is not that much head room left to operate. To make matters worst, recall we assumed our thermal impedance to be 30 C/W, but we know it could be higher than this (e.g. ~40 C/W), depending on the board, its number of layers, copper density, layout, copper structure, etc. We don’t even need a warm day to realize chances are our application is toast! If on the other hand you had a thermal impedance of 0 C/W then it would be impossible for the device to remain hot or have a temperature rise. As soon as the heat source is removed, the heat goes into the outer world (or namely 4 W * 0 C/W = 0C temperature rise which means the die would be sitting at ambient temperature or 25C). Needless to say, 0 C/W is impossible (as far as I know), but very-very close to 0 C/W is not. Hence, what we want to do is make our system’s thermal impedance as close to 0 C/W as possible. Most people would think about adding a heat sink on top of the device but this is really not going to help at all since the thermal impedance of the plastic covering the semiconductor device is too high. Hence, a heat sink on the top of the package is a big waste of resources. HTSSOP devices need a heat sink from the bottom, which is why the board is designed to behave as a heat sink. A PCB alone, however, can’t cut it under high stress conditions, so ideally we would need to add yet another heat sink at the bottom of the device in question. But how can we reach the bottom side of the chip if the board is in the way? Well, you can always make way, can’t you? That’s so simple yet effective, I can’t believe no one has thought of this before! Where can Iget boards made with power peg? The TCAP-4325 Thermal connector from TEM Products Inc. provides 2.0°C/W resistance with an easy to solder design. The website is http://www.thermalconnestors.com .